Building brand affection is one of the best things you can do for any product. Think about it -- do you ask for a tissue or do you ask for a Kleenex? Do you look for a plastic bandage or do you ask for a Band-Aid? Do you "use a search engine to find out information about your blind date" or do you Google them? This is more than performance marketing -- which evolved solely to drive transactions and downloads -- this is awareness marketing. And for the games community, it's about getting people to remember and associate an emotion with your game, so they seek it out now -- and later. But brand awareness is hard to measure -- and hard to get your arms around. Many games teams spend little to no budget, favoring the results-focused performance marketing. We're going to show you how to be better than them -- and get the advantage for your mobile game, starting today. 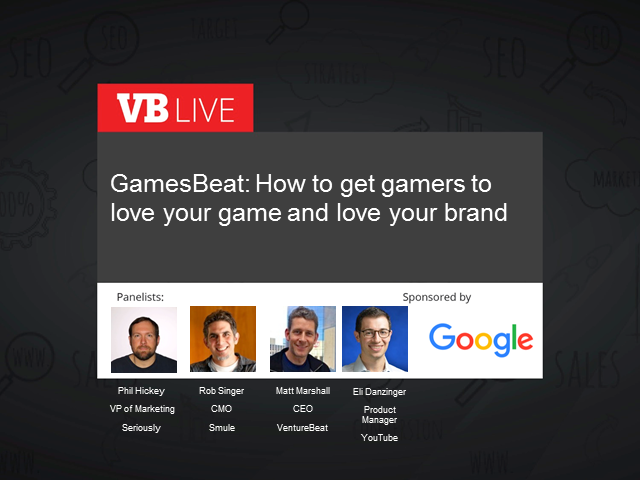 Venturebeat's own CEO Matt Marshall will sit down with execs from the gaming industry such as Seriously's VP of marketing and Eli Danziger, product manager for YouTube Ads as well as the CMO of Smule, Rob Singer. Together, we'll discuss storytelling and brand awareness marketing tips tailored to mobile games today. * Understand the right KPIs to measure ROI on awareness marketing. Don't miss out. Register today and attend live for this interactive mobile gaming panel.